NIALL SAYS: This is a gorgeous recipe to try if you are a competent home baker and you have a food mixer at home. You can experiment by adding dried cranberries and pistachio nuts to the dough. It is best served warm. 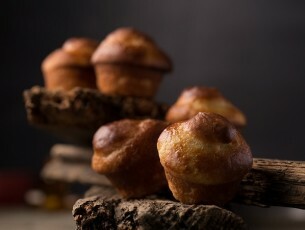 Day-old brioche is wonderful to use in bread and butter pudding, and it also makes great French toast. I often make this over the weekend so that we can have French toast with fresh berries and maple syrup for lazy brunch on Sunday at home. Weigh up the dry goods, butter and liquids separately. Mix the dry ingredients and liquid in the food mixer with the hook attachment for 4 minutes in slow gear and 5 in fast. Then add the butter and mix for 4 minutes in slow gear, before increasing to fast until the dough doesn’t stick to the bowl. This will take between 4 and 7 minutes depending on your mixer. Leave the dough to rest for 30 min, roll it flat, and fold it in four. Cover with cling-film and place in the fridge for at least 12 hours. Weigh up pieces of dough as desired (60g for one person, or 250g for a loaf). Shape the dough and then leave it to grow at 22C for 2 hours, covered with a damp cloth to avoid it forming a skin. Line a tray with baking parchment and bake in a pre-heated oven at 180 c (160 c Fan)/ 350 f/ gas mark 4 for 10-12 minutes for the individual 60g buns, or 15-18 minutes for the 250g loaves.